If you missed the Flotsam: Adrift Amongst the Stars Kickstarter, you can now get in on the action by Pre-ordering on Backerkit. Flotsam: Adrift Amongst the Stars is a roleplaying game about outcasts, renegades and misfits living in the belly of a space station, in the shadow of a more prosperous society. You play through their everyday lives, interpersonal relationships and small-scale drama in the Below, a dangerous world where poverty, social strife and gang conflict sit side-by-side with alien technology and supernatural weirdness. Imagine the Belters of the Expanse watching as Earth and Mars shape their lives, the civilians in Battlestar Galactica living with the decisions made by the military and the folk of Downbelow in Babylon 5, abandoned to destitution and squalor by those who built the station. This game is about characters like that. The game is GMless and diceless, with rules that point your characters at each other and bring their relationships into sharp focus. They help you create a rich setting, flawed characters, and charged relationships which develop over time. You’ll watch your characters evolve and change before your eyes. It’s really cool. In the run up to our planned Kickstarter of Lovecraftesque, I’ve been busily crunching numbers to make sure that the whole thing will fly financially. All of our figures have gone into a spreadsheet, where I can easily update the costs as I get better information, and tweak the prices of the rewards to reflect those costs. In turn the spreadsheet works out how much we need to ask for. Anyway, having gone to the effort of creating it, it seemed like other people might find it useful. If you give it basic information about your crowdfunding campaign (like reward levels, costs and so on), it will work out your reward levels for you. I’ve included instructions on how to use it (at the top and in comments on the relevant cells). In brief: fill in the yellow bits and then read off the information in the green bits. The first draft of the Lovecraftesque rules is now complete, and we’re looking for playtesters to try it out. A reminder: The game is all about creating your own story of brooding horror in the mould of Lovecraft, but without using any of Lovecraft’s material. It’s a GMless game, in which you spend most of your time as a narrator whose role is to intrigue, torment and terrify the Protagonist. You and the other players create strange clues for the Protagonist to investigate and, ultimately, draw them together into a compelling Final Horror to drive the Protagonist to despair or insanity. The game takes about 3-4 hours, and requires 2-5 people to play. If you would like to playtest the game, leave a comment here or email me at lovecraftesque at vapourspace dot net. We’re looking for feedback by Saturday 14th March – if you can’t play before then we’d still love to hear from you, but we’ll be moving forward with the next stage of the project after that. Admiral Frax adds “I’d really value hearing from people who don’t know any Lovecraft. The game should be set up so it is equally enjoyable with or without knowledge and I’d really like to know if that holds true.” Good point. Lovecraftesque – who watches the watchers? Since the last post we’ve been hard at work nailing down the few remaining details of Lovecraftesque that weren’t already nailed down. We’ve conducted an informal playtest that went well (though we didn’t have time in the end to try out the Journey into Darkness or Final Horror, which are two parts of the game I’m excited to see in action). And I’ve been beavering away turning our notes into a proper set of instructions so other people can playtest the game too. Plus we asked people on our G+ feeds who would do good art for this game, which yielded some really excellent suggestions. It’s been a busy week. Anyway, a bit more detail about the game is in order. One of the things that’s unusual about the game is that there’s (normally) only one Protagonist. This mirrors Lovecraft’s fiction, but there’s also a very good reason for it – it creates a sense of isolation and helplessness that just isn’t there when you have a party of competent people supporting each other. A consequence of this is that at any given time only one person is playing the Protagonist, which created some interesting design challenges for us. These design challenges have created an aspect of the game I’m really keen on – the Watchers. We toyed with having a completely shared approach to GMing, like (say) Fiasco, but we wanted to provide a bit more structure to help players to know who is responsible for driving the story forward, when it’s ok to contribute, and so forth. So we’ve kept the traditional GM role in the form of the Narrator (albeit rotating amongst the group) but supplemented it with the Watchers. The Watchers are able to intervene in the current scene by spending tokens to introduce fixed effects – most commonly clues, but also other things, like suddenly turning an investigation scene into a reprisals scene. 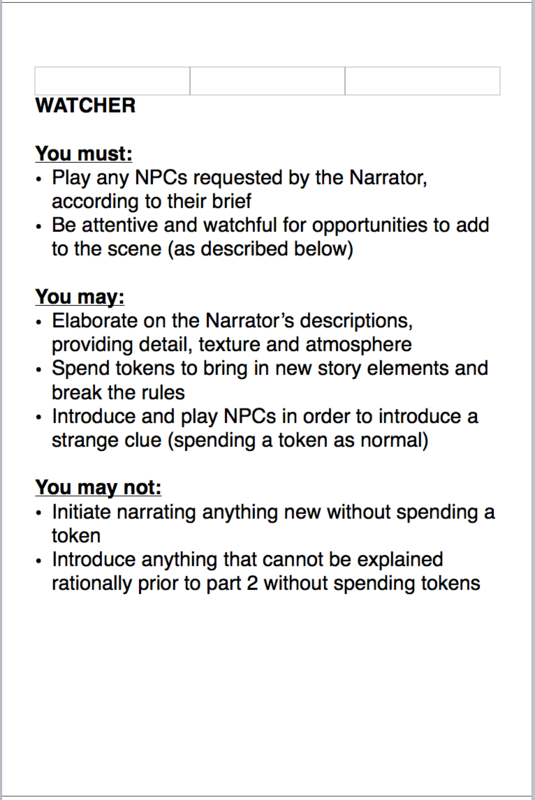 Just as important, they are allowed and encouraged to elaborate on the Narrator’s description of the environment and NPCs. This produces a powerful sense of atmosphere, in which every aspect of the scene is dripping with vague unpleasantness and tiny details the Narrator added for colour become amplified. This mechanism is placed right at the centre of things during the Journey into Darkness – more on that later. Each of the roles (Narrator, Protagonist, Watcher) is summarised on a cue card. Author Josh FoxPosted on January 9, 2015 March 20, 2015 Categories Articles, Blog, Designer DiaryTags designer diary, game design, horror, lovecraftesque, roleplaying games, rpgs, story gamesLeave a comment on Lovecraftesque – who watches the watchers?